Yawn! Dil Dhadakne Do is a snoozefest and a surefire cure for insomnia. Zoya Akhtar's Dil Dhadakne Do is a film that has its heart in the right place but its beats are terribly irregular. It is an overly caramelised and flaky dysfunctional family drama that strives - and fails - to strike a balance between the sly and the syrupy. What the film posits as sly and self-serving simply aren't piercing enough to get to the heart of the disconcerting truths it is seeking to expose, and its generous dollops of syrup translate into a treacly- sweet overdose. As a result, the nearly three-hour sea voyage, despite the game efforts of its multi-star cast to liven things up with varying degrees of spirited hamming, seems like an eternity. Dil Dhadakne Do is a mix of updated Jane Austen, Honeymoon Travels Pvt Ltd (minus the gay man sub-plot) and Bollywood excess on a super ship that brings out the worst in its passengers. Zoya Akhtar's previous outing, Zindagi Na Milegi Dobara, was a lively road movie in which three friends undertook a trip of self-discovery. The film gave us the sights and sounds of Spain like no other Hindi film has ever done. Dil Dhadakne Do goes off terra firma and boards a cruise ship with a bunch of blabbering blokes whose lives are caught in a whirlpool of lies, rivalries and unrequited desires. Most of the drama unfolds indoors, so all one gets at regular intervals are establishing shots of the ship framed against the deep blue sea - pretty but pointless. The ship drops anchor briefly in Istanbul, and one character tells another that there is magic in the air in this ancient Turkish city. True, but Dil Dhadakne Do does no justice to that magic, or anything else along the way. The film deals with two loveless marriages, a few unlikely liaisons, one exemplary case of sibling bonding and a host of matronly matchmakers in a manner so facile that the exercise resembles exactly what the film is about - a ten-day ride on a luxury cruise liner. It is a leaking ship that never gathers any momentum at all and eventually sinks under the weight of a vapid, if not outright vacuous, screenplay (Akhtar and Reema Kagti, with dialogue by Farhan Akhtar). 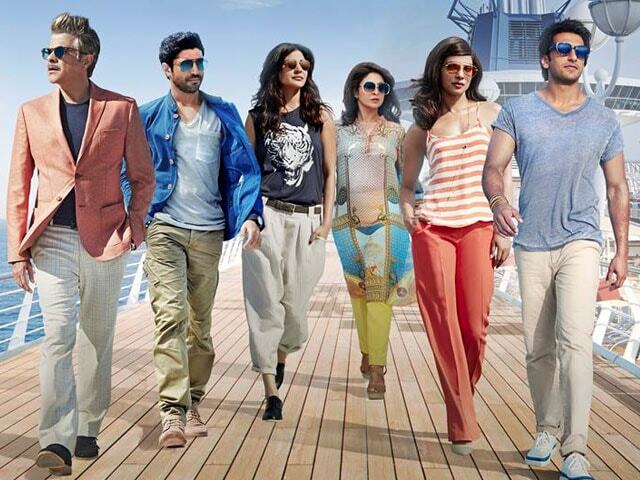 The dreary Dil Dhadakne Do isn't likely to do for luxury cruise liners what Zindagi Na Milegi Dobara did for Spain. It is a film that is beautiful to look at, but it says pretty much nothing that is startlingly original. It tells us that it is best to let our hearts lead the way no matter how complicated matters may become as a result of our words and deeds. So there you are, Dil Dhadakne Do revels in stating the obvious about Homo sapiens in general and Punjabis in particular, and does so through the perspective of a canine narrator that is voiced by Aamir Khan and who speaks lines written by Javed Akhtar. The robust and unreal Juhu 'Funjabis' that we encounter in song-and-dance extravaganzas from the YRF and Dharma stables, if nothing else, make an entertaining spectacle of themselves. In Dil Dhadakne Do, the squabbling Mehras, Soods and Khannas are a surprisingly tepid lot who do a lot of talking without getting to the point. Their antics make for a dreadfully boring, overlong film that like the ship that it is set on meanders from port to port without exploring the nooks and crannies that really matter. Dil Dhadakne Do is the story of Kamal Mehra (Anil Kapoor), a self-made man who presides over a successful company, Ayka, named after his two children, Ayesha (Priyanka Chopra) and Kabir (Ranveer Singh). The philandering patriarch and his independent-spirited daughter are both unhappily married - the former to a bored homemaker Neelam (Shefali Shah) and the latter to a Mumbai businessman Manav Sanga (Rahul Bose). All of them have huge chips on their shoulders. Ayesha, founder of a thriving travel portal, has no love lost for her narrow-minded hubby. She also has good reason to feel majorly shortchanged by her parents who not only shower all their attention on their male heir but are also guilty of forcing her to marry against her wish. Kabir, on his part, has no flair for the corporate world and flying is his "one true love". His world comes crashing down when his dad decides to sell the family plane because it is a dead investment for his debt-ridden business. Amid the impending crisis, to celebrate their 30th wedding anniversary, Neelam and Kamal Mehra invite friends and family over for a cruise in the course of which long-suppressed tensions and frustrations tumble forth and ignite unseemly friction. Kamal is too full of himself to notice that neither his wife nor his son and daughter think much of him. The same is true of Manav, Ayesha's husband who believes his wife would always be at his beck and call despite the fact that she is an entrepreneur in her own right. On the ship, Ayesha comes face to face with her first love, Sunny Gill (Farhan Akhtar), the son of her dad's trusted manager, while her drifter-brother falls head over heels for dancer Farah Ali (Anushka Sharma). More complications, more sweet nothings. Hindi cinema history has seen one big film about "loving your parents". Dil Dhadakne Do is about "hating your parents" and in the process compelling them to change their ways.